With 11 stamps in the set, the stamps (as printed in sheet form) are divided into part 1 and part 2 but are only sold in pairs. (£20 per pair). The two FDCs are different with one showing the exterior of the "Old" Wembley and the other an inside view of the "New" Wembley. 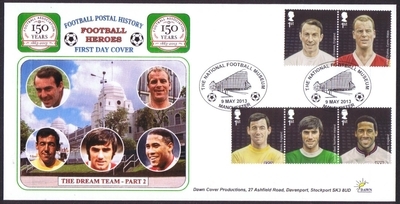 Images of the players appear in the same order as on the stamps.